“Mr. Prevost” was either Major Augustine Prevost, Jr. (1744-1821) who was living at the Prevost manor house in Greenville, NY, or his son John Augustine Prevost (1769-1822) who settled in Cooperstown in 1805 and later was lost at sea in the wreck of the Albion, the same shipwreck in which George Clarke’s eldest son, George Hyde Clarke was lost. Major Prevost’s sister, Anne Margaret Prevost (d.1821) had married George Clarke’s brother Edward Hyde Clarke (1770-1826) in 1791 and lived in England, so there were close family ties. 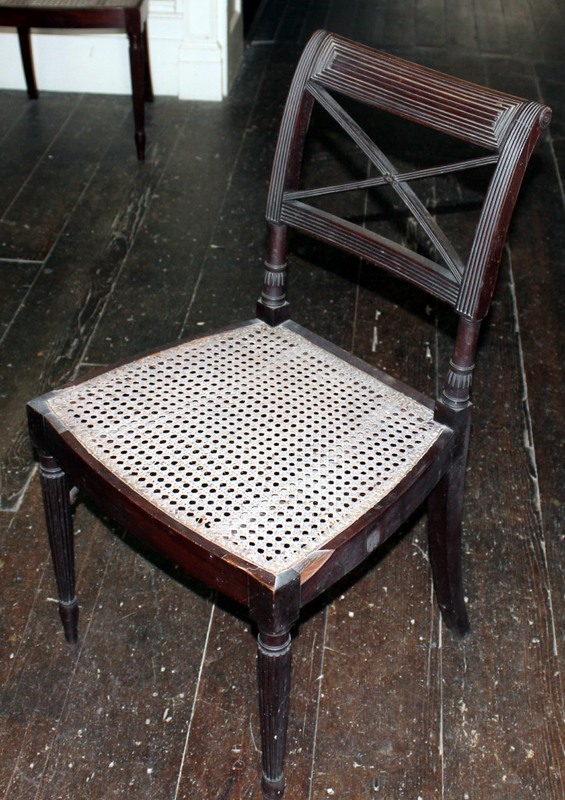 The chairs manifest the finest work of the well-known cabinetmaker Duncan Phyfe of New York City. They are the cross-bannister, scroll back design with straight reeded legs that is so well documented by Peter Kenny, et al. in Duncan Phyfe, Master Cabinetmaker in New York (2012). The Prevost chairs are very similar to one of the Bayard family sets of chairs, but have a simpler crest rail carving of a rectangular reeded plaque rather than the bowknot-and-thunderbolt design. For the inverted cup-and-column design on the rear stiles, however, the cups are reeded. Originally there would have been seat cushions with squared edges. The chairs were brought to Hyde Hall in 1819 when the family moved from Albany.